Garland was formed in 1891 to join together the competing cities of Duck Creek and Embree, and that pragmatic approach to community building still inspires development in Garland today. Public and private partnerships have revamped older sections of Garland into stylish mixed-use properties. With thousands of acres of parks, sports fields, and greenbelts located within the city, it’s clear that Garland residents enjoy life in the great outdoors. Many Garland homeowners use swimming pools and spas to extend those fun-in-the-sun experiences into their own backyards. Texas Fiberglass Pools Inc. provides the services needed to keep pools looking great, from Garland fiberglass pool repair, swimming pool resurfacing to pool repairs and pool maintenance. The team of pool contractors at Texas Fiberglass Pools Inc. is ready to meet every need in Garland with a wide range of services and products, from water feature installations like fountains and waterfalls to fiberglass pool resurfacing. We make swimming pools and hot tubs look and operate like new and can craft new installations to appear like they’re part of your natural outdoor environment. Whether you need Garland fiberglass pool repair, deck resurfacing for your business, pool plumbing repair for your home or baptistery resurfacing for your place of worship, Texas Fiberglass Pools Inc. offers you stylish and affordable solutions. At Texas Fiberglass Pools Inc. every project begins with a personal consultation to assess your specific needs. We’ll provide you with a free written estimate so that you’ll know just what to expect from our team of professionals. We’re confident that the results will exceed your highest expectations. Plumbing repairs are an unavoidable necessity in any commercial or residential property ownership. We are experts for all your plumbing needs. If you are in need of Garland fiberglass pool repair, plumbing maintenance, repair, or a new installation, our technicians handle the most complex Dallas plumbing repair jobs with industry expertise, timeliness, precision, and – most importantly – success. We use only the most trusted and durable parts available on the market for all pool and plumbing repairs, to ensure our jobs are guaranteed to extend the life of your property and prevent problems caused by unreliable materials. Looking to rejuvenate and renovate an aged pool with new coping or tile? 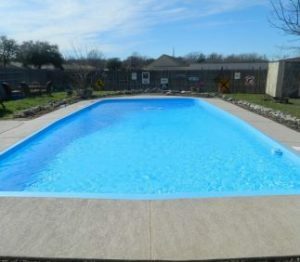 If so, you can count on the coping and tile repair and replacement services available through Texas Fiberglass Pools Inc. Our coping and tile services involve a team of expertly trained specialists, whose goal is to provide you with a seamless and beautiful outer surface for your pool or hot tub. Our team will install, repair, or replace the protective capping over your pool’s walls and edges with various materials: tiles, fiberglass, stones, and more. You will find an amazing selection of colors and styles to create a customized, beautiful, and luxurious outdoor oasis that will be both visually appealing and act as protection to maintain the pristine lining of your pool, for many years to come.